This week has been a whirlwind. We are lucky that most weekday mornings in our house are fairly leisurely. But, this week, it's been a grab-n-go scenario. That's why I was so glad I planned ahead and made these baked oatmeal muffins over the weekend. They are perfect for busy mornings for when you want a healthy and satisfying breakfast you can eat on the go. I pretty much wake up hungry, so I need to eat something in the morning. Most "easy to eat on the run" breakfasts just are not filling enough for me and I wind up hungry again. 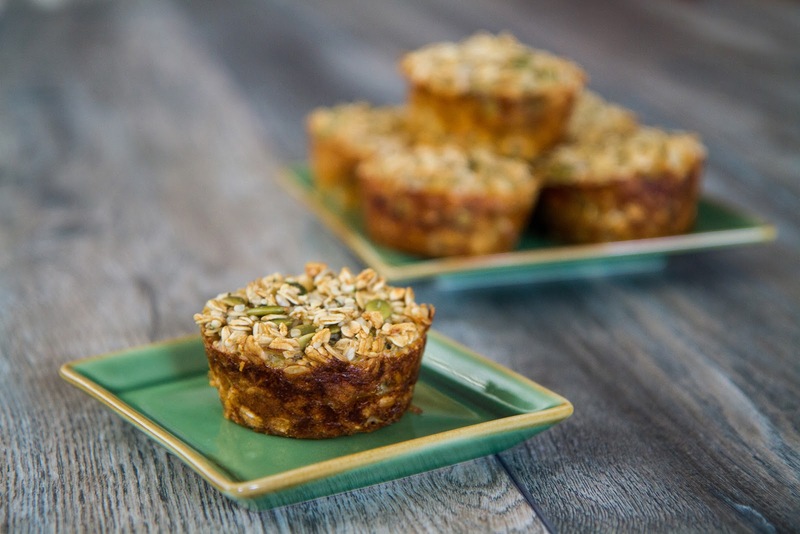 That's why I tried to pack in lots of healthy and hearty ingredients into these muffins. Hemp hearts are one of those "superfoods" you hear so much about. They typically contain 33 percent protein, 9 percent omega-3 essential fatty acids, and are a great source of iron, and vitamin E. Raw sunflower seeds are also a good source of protein, fiber, and a bunch of vitamins and minerals, including vitamin E and magnesium. Pepitas (aka pumpkin seeds) are another ingredient powerhouse, filled with magnesium, zinc, omega-3s, and antioxidants. Together with old-fashioned oats, you have a dense muffin that can keep hunger pangs at bay. In this month's Degustabox there was a box of Prince of Peace Ginger Honey crystals. It's made of cane sugar, honey, and ginger. Typically it's enjoyed as a tea to soothe an upset stomach. You just stir a packet of it into a glass of hot or cold temperature water and sip. As a tea, I find it much too sweet. However, it came in handy for this recipe, lending each muffin a teensy bit of sweetness and light ginger flavor. 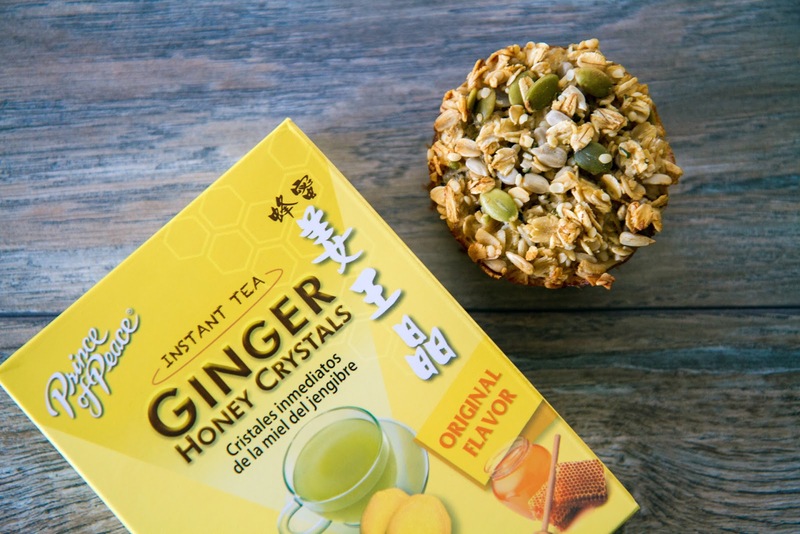 If you can't find or don't have a packet of ginger honey crystals, no worries. I would suggest substituting it for 1 tablespoon sugar and 1/4 teaspoon ground ginger. Grease muffin tin. Set aside. In a large bowl, combine oats, baking powder, hemp hearts, sunflower seeds, pepitas, and salt. In a medium-sized bowl whisk together egg, 1 tablespoon coconut oil, milk and ginger honey crystals. Pour liquid into dry ingredients. Stir well. Divide evenly amongst 6 muffin cups. Bake in the oven for 25 to 30 minutes, until golden brown.